Design Thinking 1: What is it? Want a better mousetrap? Want hotels that feel like home? How about a new way of thinking about literature? A new way to design curriculum? You might consider Design Thinking. While there are a number of varieties and definitions, design thinking is a process, much akin to Creative Problem Solving (CPS), in which the strategies of designers are used to address all manner of needs and problems. The term has roots with David Kelley at Stanford’s famous d[esign] school. It is the core of thinking at IDEO—source of innovations for businesses from HBO to the TSA. [W]e moved from thinking of ourselves as designers to thinking of ourselves as design thinkers…What we, as design thinkers, have, is this creative confidence that, when given a difficult problem, we have a methodology that enables us to come up with a solution that nobody has before. Design thinking assumes everyone can be creative, given the tools and strategies to do it. Design thinking is all about problem solving. And where do we need problem solving more than in schools? Design thinking can be used by teachers addressing problems in schools or curriculum (and we do have a few of those, yes?) It also can be taught to children. In fact, some schools are choosing design thinking as an organizing principle of their curriculum. I’ll share a few of those in my next post. For now, it is interesting to compare the stages of the Stanford model of design thinking to creative problem solving. Empathize. The first step in design thinking is unlike any other problem solving strategy I’ve seen: Empathizing. In most cases designers—and many others—are addressing problems that affect others. In order to offer the best possible solutions, it is essential to understand others. Design thinkers may observe, discuss, and listen to others in order to come to deeper understanding. 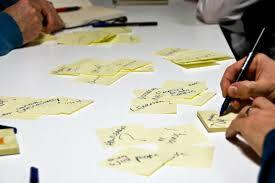 Working with a team, design thinkers collect information about potential users or other people involved. It is interesting to think about how the work of empathizing can support studies of history and literature as well as more traditional design tasks. Define. In this stage you define the design challenge—or finding the problem. This stage is very similar to the Framing the Problem (or Problem-Finding) stage in CPS, except it is framed as a Point of View (POV), and may be more narrow than a typical problem statement in CPS. A good POV is grounded in insights about the users and focuses the problem, but it also captures the enthusiasm and imagination of the design team. Ideate. This stage parallels the Generating Ideas (or Idea-Finding ) stage of CPS in generating many varied ideas for addressing the problem. Many other creative thinking strategies can be used here—mind mapping, sketching, SCAMPER, building, etc. Prototype. This is another stage that is, perhaps, idiosyncratic to the design thinking process. Prototyping asks the design team to produce an artifact of some type that can be shared with those whose problem is being addressed. It could be a model of a gadget, but it also could be a storyboard, a role playing activity, or anything else that allows the ideas to be shared in an interactive way. 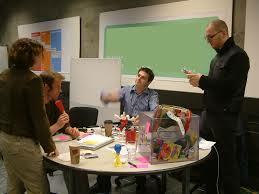 A team may prototype several ideas to see which are most effective and appealing to the audience. The stage of CPS tries to anticipate problems that might be encountered in a prospective audience, but the design thinking process actually confronts them. Test. This is where that confrontation takes place—users are asked for feedback about the prototypes. Again, CPS addresses the need to build acceptance, but doesn’t specifically suggest trials by users, likely because CPS was created in order to address all manner of problems, and design thinking (not surprisingly) has its roots in designing “stuff,” though its uses now are much wider. You might want to take a look at this brief introduction to design thinking available from the Stanford website. Think about how the strategies could be used for school problems and curriculum innovation. More next post! « What’s Your Worst Idea?